Welcome to Wiremo! 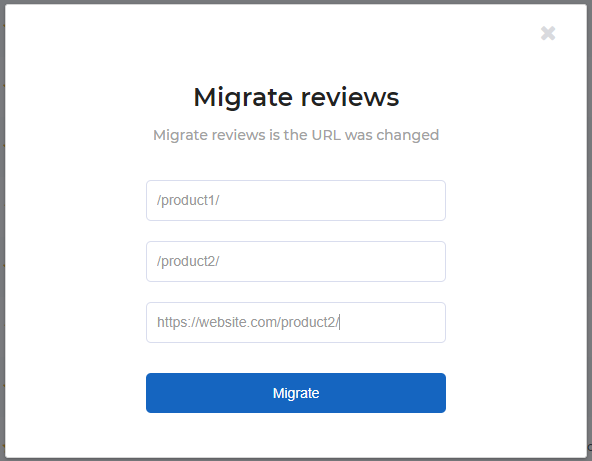 With our friendly and easy to use the platform you can move your customer reviews from one page to another in just a few clicks. Let’s see how to do this. Login to Dashboard and go to Reviews (pin 1). In the right corner of the tabs press on the "Migrate Reviews" button (pin 2). To start the migration process please press the "Migrate" button. Below you can see an example of the migration pop-up window with all the field fulfilled. Once the process is finished you will be notified.